NB: To give some context to these results bbc.co.uk has a Social Meter score (ie. no. of links) of 812,959 and mySpace has a staggering score of 9,336,031. Using BlogPulse trend analyser (which monitors buzz around words and phrases) this situation is confirmed. 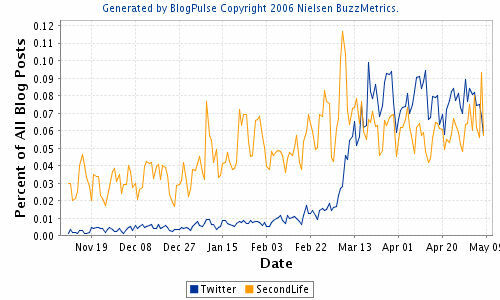 The graph shows that by 16 March 2007 the buzz within blogs about Twitter equalled and then passed the buzz around Second Life, although of late this situation has switched. Compete – Snapshot reports far more conservative figures for data up to March 2007, but shows a similar trend for visits, but with Second Life having more visitors. Twitter is indeed doing rather well in embedding itself within the web, particularly the social web. From this analysis it is quite clear that since November 2006 Twitter has made remarkable gains. However, looking more closely at the numbers of visitors, which gives us an estimate of the number of regular users, Twitter is still small in global terms (and in this respect is not that dissimilar to Second Life). But it is still new, and young and yet to find a wider appeal and use. One might also be able to conclude, that despite Second Life achieving great PR within the press and media it is still struggling to get a foothold online – perhaps almost because it has been PR’d to extinction offline? Here is where any comparisons with Twitter breakdown. Twitter has a very low point of entry whereas Second Life has a much higher point of entry, initially requiring more from the user, including computing power. This low point of entry and ease of use has enabled Twitter to quickly gain a following, even though its long term use is not quite clear (more of which in another post), many find it a fun tool to add to their social networking box, which cannot yet be said for Second Life.